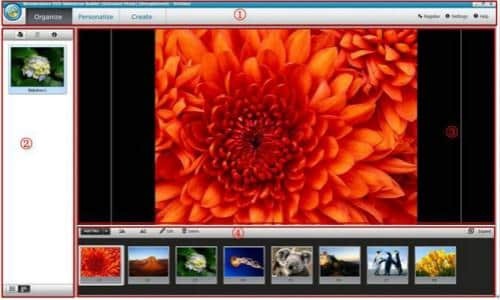 Wondershare Photo Story Platinum is an intuitive photo slideshow maker which you can easily create your own DVD photo slideshow, video slideshow and more. It enables you to make the most of your photos and videos and preserve your precious memory with ease. Having high compatibility with hot devices and sites, you can directly publish your photo story on YouTube, or save it for playing on your iPad, iPhone and more. Learn more about Wondershare Photo Story Platinum. Able to burn your photo story to DVD. Directly share on YouTube, Facebook & virtually anywhere. 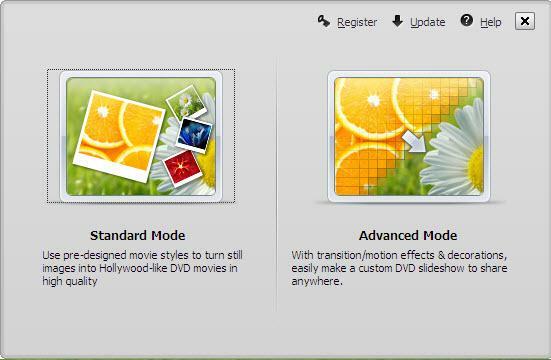 Standard mode: provides some ready-to-use movie styles which you can choose directly for your slideshow. Advanced mode: provides more customization features which you can make your own stunning photo slideshow. After the mode selection, click the Add Files button to import your photos and videos. Click the Personalize tab. Then you can add transitions, effects, background music and more t create your own gorgeous photo story. You can import your photos and videos at one time and arrange the order by dragging. To tell your own photo story, you can add captions to each photo or record your own voice by click the Voice Over button. After the customization of your photo story, click the Create tab and choose your way to save the photo story. The photo story maker provides sorts of methods for you. For example, if you want to burn your photo story to DVD, click Burn to DVD button. And if you want to share it on YouTube, choose Share to YouTube so that you can share it directly without open your YouTube page via browser. Learn more: user guide of Photo Story Platinum for Windows here. Learn about the detailed technical specifications of Wondershare Photo Story Platinum for Windows.